To honor World ‪Down Syndrome‬ Day BridgingApps is sharing the success story of Blakeley. 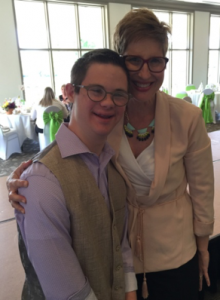 My son, Blakeley Kress, is an amazing young man who just happens to have Down syndrome! 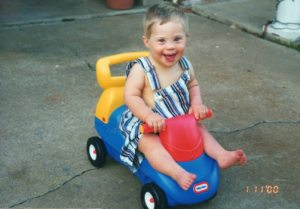 Honestly, when I was pregnant with him, we had no idea he was going to have Down syndrome. When we were told, minutes after he was born, I was terrified. I remember thinking that I would never be happy again, that there would be no joy in his life or in ours. How crazy wrong I was!! Blakeley’s life ha s been all about joy, and he has infused our family with it as well. 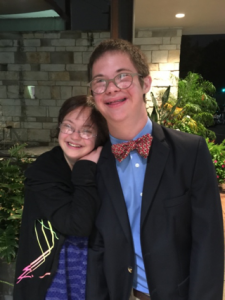 Blakeley was lucky enough to get to attend The Rise School of Houston, a preschool for children with and without disabilities, and in fact, was in the very first class at Rise, starting there the day it opened on January 20, 2000. There, he learned to walk, to talk and to read. He graduated from Rise in 2004 and went on to be mainstreamed in his elementary, middle and high schools in Spring Branch ISD. Blakeley LOVES being a senior at Memorial High School. 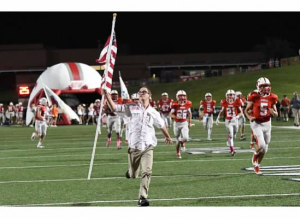 He is manager for both the varsity football and rugby teams (go Stangs!). He has a lovely girlfriend, Miriam. They love to go out for Mexican food and play basketball together. Blakeley enjoys his Economics class, as well as Money Matters, learning all about finance, taxes and savings. He has always been good at things that involve numbers. He is VERY quick on the iPad, using it to follow his twin passions of music and sports. He is learning to play guitar and posts lots of videos of himself playing his favorite songs (thank you, Ed Sheeran!) He can also tell you anything you might want to know about professional football or basketball players and their teams. 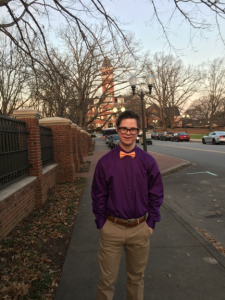 He also loves to play basketball and is a leader on his Special Olympics team. Blakeley’s dream is to go to Clemson University, in their LIFE program. Curren tly, he is on the waitlist for that program. We honestly believe that he is meant to be there and that this dream will come true in the fall. We are thankful for all the help from friends, family, teachers, doctors, therapists, members of our church and Rise families who have made Blakeley into the successful, confident young man that he is today. If Blakeley’s life has taught us anything, it is that people are basically good and that they will go out of their way to help. He is the light of our family and we know he will go far, in his dream career in sports management and in all the things he puts his mind to. I consider it a privilege to know Blakely and count him a friend. What a wonderful young man he is! The apple doesn’t fall far from the tree, though. His whole family is quite special. Yay Blakeley! You are a true inspiration! Much love to you and your sweet Momma!